NIS America and SNK have announced that SNK 40th Anniversary Collection will be supported with free downloadable content, that will add 11 more retro classics on December 11th. The undead have taken over the city, and it’s up to three tough guys to stop them! Clear the invasion only to face unusual bosses, and pray to whatever deity that you’ll be able to make it out alive. Avoid crashing your plane as enemies bombard you! Shoot your way through while collecting power-ups that change your plane’s form, but beware: losing health downgrades it, as well! “Emergency! This is not a drill!” It doesn’t get much more metal than this! Shoot up tanks, ships, planes, and more to defend against enemy troops. See if you’ve got enough firepower to carry out your mission in Chopper I! Your sweetheart has been captured and it’s time to get her back in Fantasy! To rescue your loved one, trek through the wild jungles and soar above the sea—seems like nothing can get in between you and Sherry! In Munch Mobile, control a car with a human limb and cruise through various scenic routes to reach your ultimate destination: the garage. Pick up various objects along the way, such as fruit and gas canisters. What a handy vehicle, don’t you think? This historical title is the very first developed and published by SNK! Known as the first action game ever to utilize a “health” bar, the player pilots a space craft to guard against galactic adversaries. Can you emerge as the superior virtual athlete? Put your reflexes to the test as the game pits you against not only your fellow tennis players, but also other sports professionals in a tournament reminiscent of the Olympics. What has happened? Two men are sent to uncover the facts behind a space shuttle’s disastrous crash. Run ‘n gun your way through the debris, but try to avoid needing your own search and rescue squad! 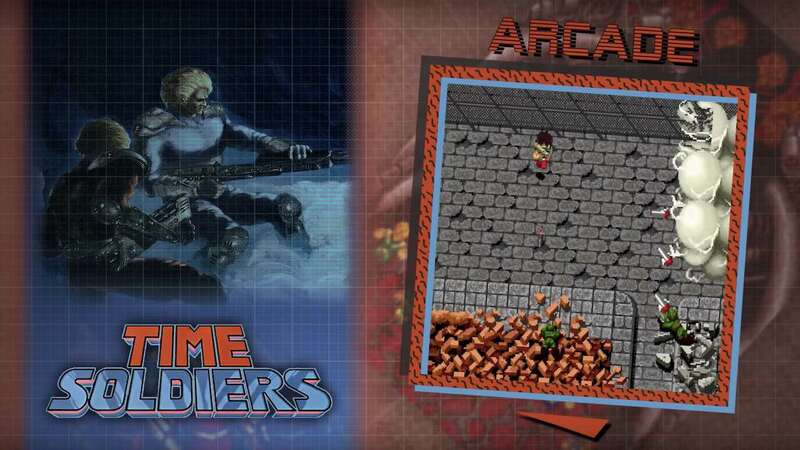 Traverse through time with the “D-Scanner” to rescue your comrades in Time Soldiers. There’s just one caveat: if you’re not in the correct place in history, you must defeat that era’s boss before making the leap to the right time period your fellow soldier is trapped in. Sneaking in as the final DLC title, this vertical shooter features you as a pilot engaging a myriad of airborne foes! Alternate the formations of your protection squad to gain the ultimate advantage! SNK 40th Anniversary Collection will release for Nintendo Switch in North America on November 13th and in Europe on November 16th.